My Official Preconception: Some kind of grim Western deal, maybe? Back in the day, you knew what to expect from a movie set in the arid American West. The noble cowpoke, living according to a rugged, manly code of honor, held fast to his freedom against the always threatening encroachment of rules, fences, due process, and womenfolk. There was plenty of violence, sure, but that was what a man had to do to protect himself from Native Americans and other, black-hatted cowpokes who sought to encroach on the property rights of others. In the last three or four decades, movies have followed historians into a more sophisticated understanding of Western history, and many a fine Western has taken seriously the experience of Natives, women, Hispanics, and so on, has looked at the regional ecology as an integral part of the story rather than just a scenic backdrop, and has considered the contests for power among elites that shaped the lives of humble folks trying to get on from day to day west of the Mississippi. These films are often called “Anti-Westerns,” and many of them are pretty cool. 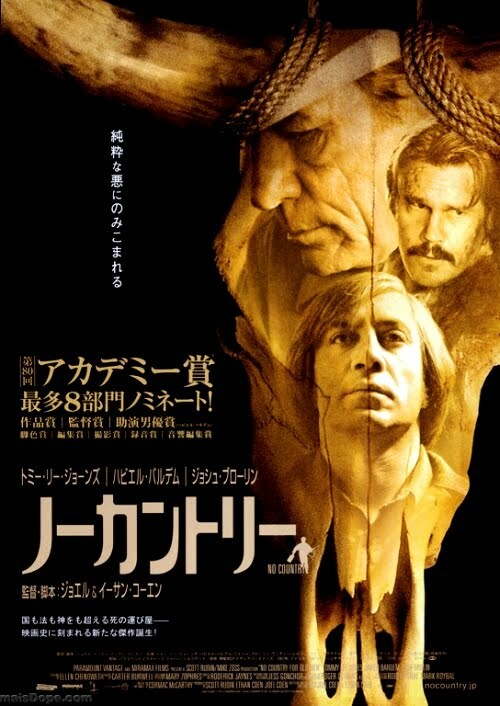 The Western trope that is most dramatically inverted in No Country for Old Men is that of the masculine protagonist’s doomed battle against the forces of civilization. In No County, the “good guys” represent civilized virtues and values, and their battle is against the forces of chaos and lawlessness. In the central plot, those forces are manifested by nasty business in the cross-border drug trade and by a spooky hit man who kills lots of people on drug-trade business, but also in fulfillment of his own rugged, manly code of honor. So, what you have here is perhaps not as much an Anti-Western as an Inverted Western. Now then. It is beautiful, and depicts the West Texas landscape with exquisite care and sensitivity. It is also thoroughly saturated with senseless violence, and therefore not a good pick for those averse to scarlet sprays of blood in their filmed entertainment. The acting is beyond reproach, with characters vividly realized from the leads right down to the non-speaking extras. (For those of you following along with the DVD, take a look at the scene where the Bad Guy has his procedural showdown with the trailer park manager. You could write a book about that marvelous woman behind the desk. In fact, let’s get that character actress’ name into this review, for she is fabulous: Kathy Lamkin). Set in 1980, the film is more or less presented from the point of view of a retiring sheriff who feels overwhelmed by a rising tide of lawlessness and disorder. Towards the end, after the movie has deviated from the expected narrative arc – was that a spoiler? – the sheriff pays a visit to a shoestring relative, a character we have not met before. He complains of how the world is going to hell in a handbasket. People have been letting him make this complaint unchallenged throughout the entire film, but his relative responds with a story of senseless violence from 1909, and points out, correctly, that “Whatcha got ain't nothin new.” Then, in the penultimate scene, an entirely respectable young man literally offers a stranger the shirt off his back. So, violence may be part of the West, or the world, but this is not something unique to these times, or those times, nor is it going to be all-pervasive in the present or in the future. And the movie’s final scene, a quiet reverie, is a subtle but perfect affirmation of this basically optimistic message. So that’s the intellectual underpinnings, anyhow. But mind you, don’t forget it’s a blood-soaked serial-killer chase movie. It's adapted, apparently pretty faithfully, from a novel by Cormac McCarthy. The title is in some ways perfect, but also makes me wonder how closely McCarthy read “Sailing to Byzantium,” the Yeats poem from which it is taken. Prognosis: * * * 1/2. I can't really give four stars to a movie about an implacable serial killer, even if this is a damn fine one and not "about" serial killing per se. Random murderous rampages are so very rare, and to pretend otherwise in our movies, as convenient as it is for a filmmaker who needs a direct route to our most thrilling fears, is socially corrosive. Having said that, if you don't mind seeing depictions of bloated corpses, execution-style murder, bones sticking out of the skin, and what-not, I recommend this film as highly entertaining and damned near technically perfect. I love the term "socially corrosive." That goes on the list of great band names. i don't know if you've convinced me to see it or not see it. i think reservoir dogs was the last violent film i saw i really enjoyed, but that was a long lifetime ago. Gosh ... I've always kind-of wanted to see this but now I'm not so sure. It sounds much more violent and disturbing than I imagined. I loved it. The baddest bad guy is so over-the-top that he lifts the violence to an almost comical level, which, for me, lessens the impact of the gore. Not sure about "apparently pretty faithfully", as (if memory serves) it seems to take liberties with the story line in the last half-hour. Not my business, but my opinion is that a five (or four) star rating system doesn't work if you (and most of the known world) have to assign a half a star. That tells me the metric is insufficient. Hence, I would use 10 stars. When I reviewed music, I used a 15 point system: -3 through +11. Basically, 1 to 10, but the minus slots (and 0) were key in rating recordings which eschewed beauty, and the 11 was important to recognize a thrice in a lifetime performance. Mags: Can I play bass? gl. : If you can handle Reservoir Dogs, you should be able to handle this. Or pretty much anything, really. Jenners: I find it kind of flattering when people seek out a movie when I pan it or announce an intention to avoid it after I praise it. It kind of implies that I'm giving a rounded view. Karma: "Apparently pretty faithfully" is second hand -- in fact, I believe it's just what Tommy Lee Jones said on the DVD's "special features," so it's from a spectacularly unreliable source. I didn't read the book myself. I'm sure that Mr. Jones did, and he seems like a smart guy, but he had a film to sell and wasn't likely to say "eh, we winged it." Regarding the four-star system: I like it. I think of it in opposition to the IMDB system of rating from 1 to 10, which is essentially the same as allowing ten stars. Interestingly, it's relatively seldom that ratings of 3, 4, or 5 are given by anyone, and I think this is because they inhabit an uncomfortable area between liking and disliking. The popularity of the four-star system (and, to a lesser extent, its five-star cousin, which I do not like) is I think due to its intuitive nature: four = love, three = like, two = dislike, one = hate. The half-stars are a nice mechanism for fine-tuning, and represent, for instance, "I like it a lot, but I don't quite love it" with more cognitive ease than would, say, a 7/8 rating. That's my story, and I'm sticking to it, "it" being the four-star rating system. Well, maybe I will watch this. I fell asleep on it before, and my husband reported that it was pointless, violent, and a waste of time. The subtlety was lost on him, in other words, probably hidden under all the blood. I have to agree with karma - about how the comic nature of the serial killer lessens the impact of the gore. In my mind I keep reviewing the service station scene (& the one with the boys on the bikes). For me it was all about the characters. I really like your explanation of the 4 star rating system - I can totally buy into that metric. M5 -- I disagree about "less cognitive ease". But, regardless, I omitted a key point, and misstated half my "argument". I used a number system of -3 to 11, not a star system. Reason being, "Star" represents something: brightness, goodness, greatness, etc. So for me a one-star rating is an oxymoron: a crap movie doesn't deserve a star. Maybe a wad of sticky gum on the floor would be a better representation. I like the 4-star system, because it's very easy to see at a glance how many there are. I would consider it an improvement if it were four stars and an X, the last being displayed only for movies that really had no brightness at all. And Michael you do excel at reviewing movies in a balanced way.